Predictions claim that 2010 will see even greater growth for ebook readers, with the format set to expand to new technological levels. 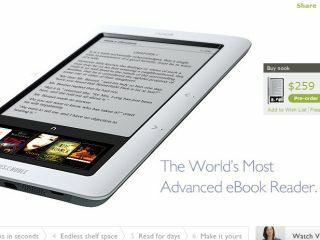 Forrester Research is predicting that sales of ebook readers have tripled in the last year, but this figure will continue to rise in 2010. One of the biggest predictions the company is making is that we'll see a big increase in non E-Ink (the low power black and white technology used to create the words) devices, with the likes of transflective LCD and OLEDs taking their place. This isn't a straight replacement, as colour and separate screens are likely to become widely used with e-book readers too to help display enhanced content. This has already been shown by the Barnes and Noble Nook reader, which packs Android technology over a colour and E-Ink screen. But while things may be good for e-book readers, the e-book itself is likely to get an even wider audience, with Forrester predicting that apps for mobile phones and netbooks will provide a more than adequate alternative to the traditional ebook. On the subject of apps, it's also predicted that the ebook readers, such as the Kindle from Amazon, will get its own application store, meaning simple extra functionality (such as social networking) will be possible. And newspapers won't lose out either - despite being slightly slow to react to the digital revolution they will be pushing for colour, video and inbuilt advertising so they can begin to market their content to a new platform in 2010 as well.